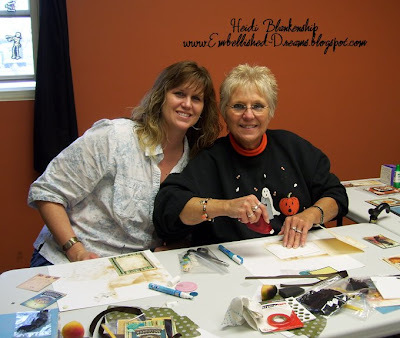 This past Sunday I was teaching a class at Scrapping On The Go and it was soOoOo much fun!! I met a wonderful group of ladies! Hi Ladies!! *waving* For the class we made four cards and a treat cone using several product from Crafty Secrets. You can click HERE to see the projects we made. I have several pictures from our day to share with all of you! 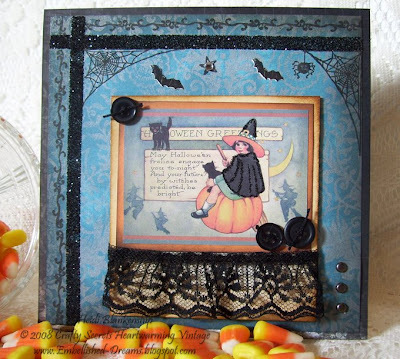 These first few are of the ladies creating the fun Halloween cards. 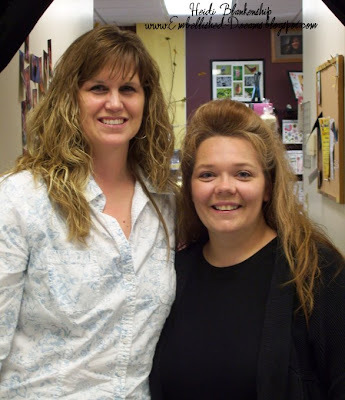 Here is Tammy, owner of Scrapping On The Go and her mom. 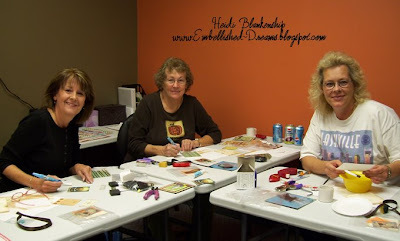 We were in the Crafting Room, which I love--it's so nice and roomy, everyone has their own table to work at and the lighting is fantastic! Here's a few pictures of the store. 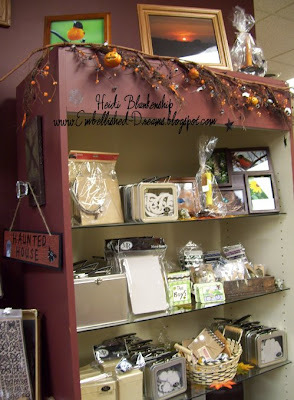 I love how Tammy has the store decorated, and she has tons of samples done up all over the place! 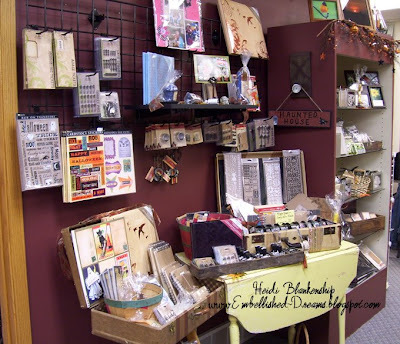 She carries a lot of fun and unique items and her store is very warm and inviting. 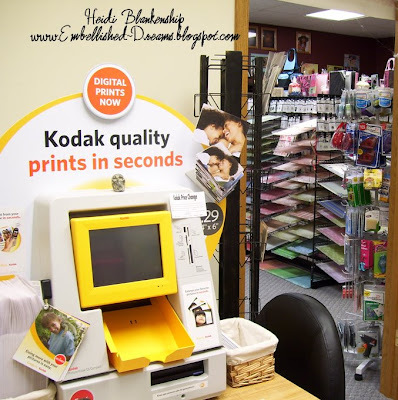 She even has a Kodak picture maker in the store! How convenient is that!! 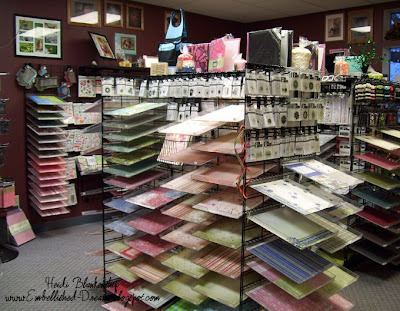 You can print your pictures and do your scrapbooking all in one stop! I know her customers absolutely love this feature!! Speaking of pictures, Tammy's wonderful husband, Mike, is a photographer and and they also have a studio in the shop, Pictures Delight Photography by Michael J. Both Tammy and Mike are very talented and together they have an amazing shop!! Here is a picture of Tammy and me. She is such a sweetheart!! Here's a few more pictures of the ladies and their smiling faces! 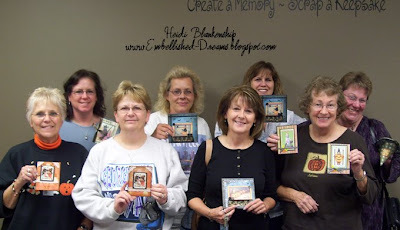 Here's a group picture with each of them holding one of their finished projects. All of the ladies really LOVE the Crafty Secrets products and Tammy will be carrying the Crafty Secrets products in her store very soon! I had a lot of fun teaching the class and I am looking forward to the next one!! Thank you so much to Tammy for having me at Scrapping On the Go and for all the ladies that came to the class for the day!! For all of you local ladies if you haven't been to Scrapping On The Go yet you should stop in and say hello to Tammy and check out her wonderful store! 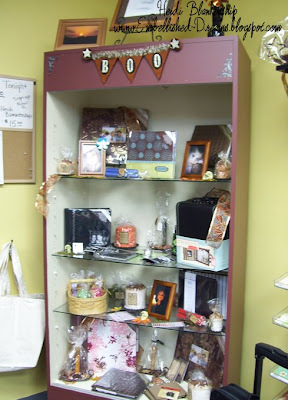 They are located at 1428 W. Main Street in Albert Lea (next to the Albert Lea Seed House). 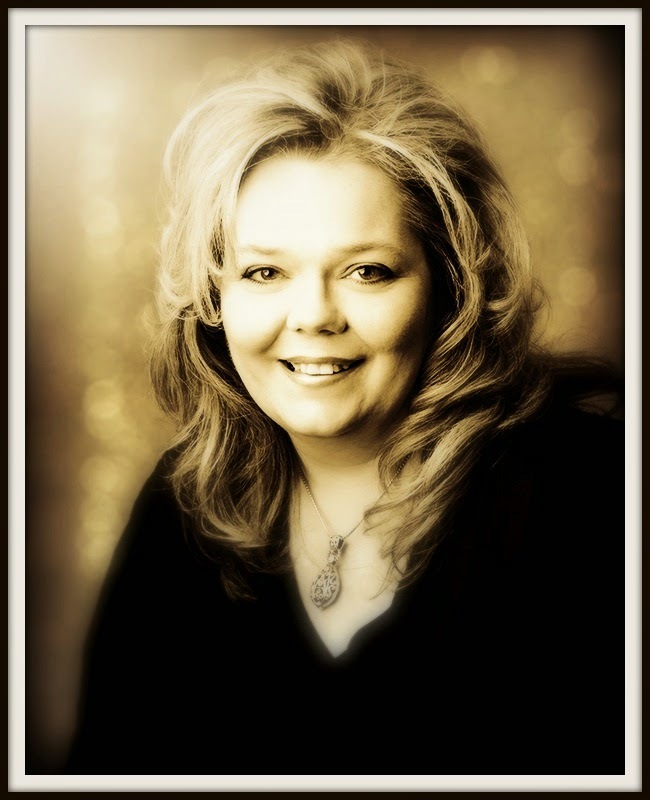 If you ever have any questions for Tammy or if you would like to hear about any of the upcoming events you can give her a call at (507) 377-6130 and I know she will be happy to help you out! Thanks so much for stopping by & I hope you have a Terrific Day!! 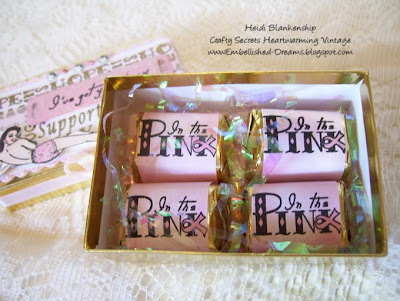 Oh one more thing I wanted to mention, hop on over the the Crafty Secrets Blog, Sandy has some amazing blog candy!! As most of you know October is Breast Cancer Awareness Month but did you know that Crafty Secrets has a really fun stamp set called Support the Girls? 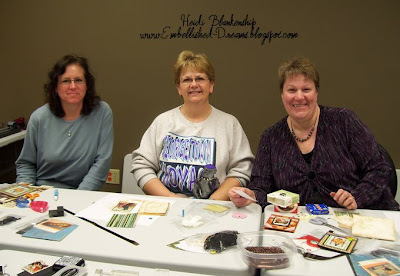 Vicki Chrisman, our Design Team Leader, thought it would be really fun to give all of us ladies on the Crafty Secrets DT a challenge by using the Support the Girls stamp set to create a card/project of our choice. I also want let all of you know that Sandy Redburn, owner of Crafty Secrets, designed this stamp set to help raise funds for the Susan G. Komen foundation for breast cancer research and Crafty Secrets is donating $1.00 from every stamp set that is sold. For my project I made a PINK ensemble which includes a candle, a little box of chocolates and a card. 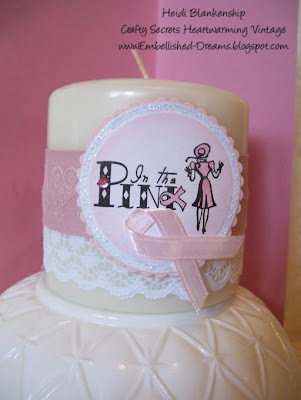 On the candle I made a band with white lace and a beautiful pink ribbon with embossed hearts from s e i. Using white CS I cut out a white Circle Nestability. I used the Copic ABS and sketch marker RV11 Pink to airbrush the center part of the nestability. Then I stamped the images from the Support the Girls stamp set using Ranger Pitch Black Adirondack Ink. After the ink was dry I colored in the dress and hat on the lady and the pink ribbon. I also cut out a Petite Scallop Circle Nestability from pink CS to use as a mat for the classic circle. I added a pink satin ribbon and some diamond stickles along with a pink rhinestone for a little sparkle and bling. For the little box of chocolates I started out with a small gold jewelry box. You can find these at your local $ store and also in the jewelry department. For the top I layered a Classic and Scallop Rectangle Mega-Nestabilities. On the white piece I used the Copic ASB and Copic marker RV11 Pink to airbrush along the edges and then I used a random word stamp from the Support the Girls stamp set and embossed it in gold. Then I stamped the image of the lady using Adirondack Pitch Black Ink and colored in using Copic markers. Then I cut out the lady and added some foam tape to the back for some dimension and then I added a little diamond stickles to her shoes. I also stamped the sentiment "I've got your back" onto a pink tag that I made using the Ribbons Tag Trio die from Spellbinders. I added some pink sheer and satin ribbon, diamond stickles and a few rhinestones to the top. Inside the box I have some Hershey's Nugget chocolates. I airbrushed on mailing lables and then stamped the sentiment. Then I colored in the diamond shaped on the letters and the ribbon. 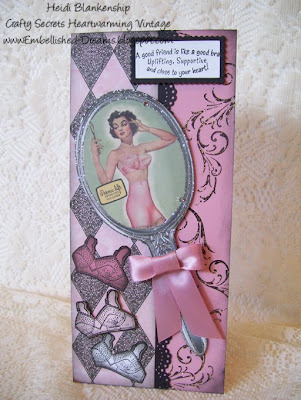 For the card I used pink and black CS and some of the DP from the Classic Paper Pad from Crafty Secrets. 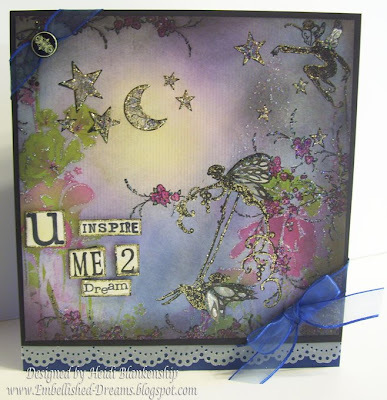 On the pink I ramdomly stamped a flourish from the Cherubs stamp set using Pitch Black Ink. Then I added some diamond stickles to the flourishes. I used a Martha punch to do the pretty black scallop. On the piece of DP I inked the edges with black ink. For the sentiment I used the two smallest rectangles from the Classic and Scallop Rectangle Mega-Nestabilities from Spellbinders. The mirror image is from the Girlfriends Images & Journal Notes booklets. I glued the mirror image to a piece of CS to give it a little thickness and then I cut it out. I inked the edges with black ink and then I added silver stickles, a couple of rhinestones and a pink ribbon. To give it some dimension I added foam tape to the back. Then I stamped the image of the bra from the Support the Girls stamp set three times using three different colors of CS. I cut them out and then inked the edges in black. I taped down two of them and added some foam tape to the middle one. 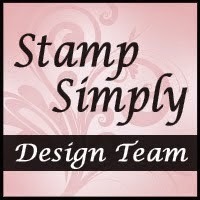 Don't forget to check out what all of the ladies on the Crafty Secrets Design Team created using the Support the Girls Stamp Set!! I know they will have a ton of great inspiration for you!! 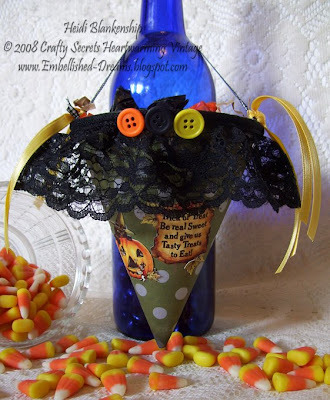 Also don't forget to check out the Crafty Secrets Blog!! Thank you so much for stopping by and I hope you have a WONDERFUL Day!! 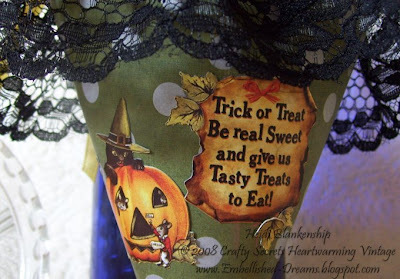 Crafty Secrets Halloween @ Scrapping On The Go! 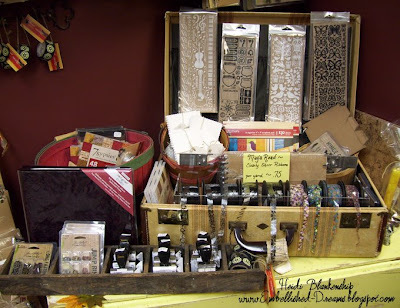 This coming Sunday, October 19th I will be at our local scrapping and stamping store, Scrapping On The Go. 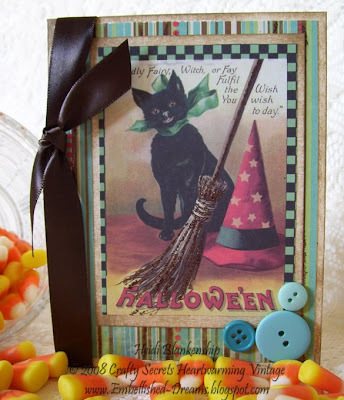 I will be teaching a Halloween class using lots of fun products from Crafty Secrets Heartwarming Vintage Collection. I wanted to share with you the projects we will be making in the class. I have LOTS of pictures to share with you so this will be a picture heavy post! But before I do I want to share with you the products that we are using for the class. 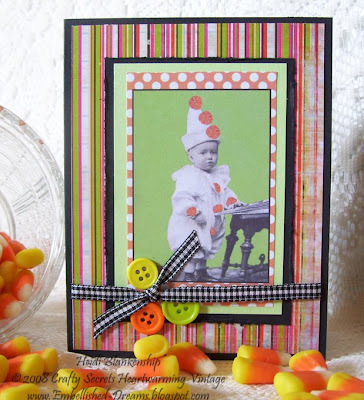 Here is a list with links to all of the Crafty Secrets Products, if you click on each product you will be able to see it--Halloween Fun stamp set, Halloween Treats sticker sheet, Halloween Time vintage cuts, Halloween Image & Journal Notes booklet. Here is the first card we will be making. 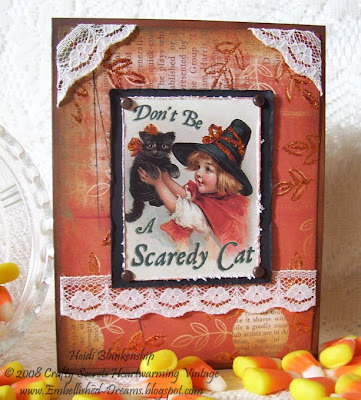 The image is from the Halloween Time vintage cuts. I think this image is so Adorable! The DP and glitter is from Pink Paislee and all of the other CS is from WorldWin. Here is a close up of the image. 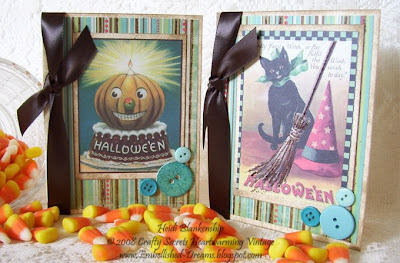 These next two cards are really quick and easy Halloween cards. 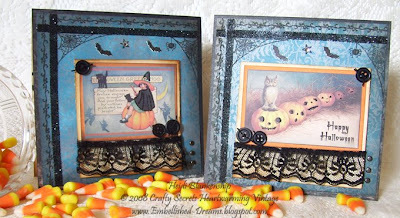 The images from both of the cards are from the Halloween Image and Journal Notes booklets. The DP is from Pink Paislee. Here's a close up picture of each card. The next project is a little vintage style Treat Cone. 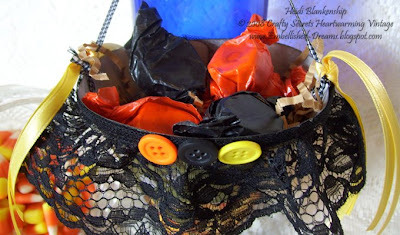 These are fun to make and they are very quick and easy too! You can make them very simple and pretty or you can load them up with all kinds of stickers, lace and embellishments and make them very fancy. If you would like to make one of these you can download a FREE template by clicking HERE. You can also use this same template to make decorative party hats. For this project we will be using stickers from the Halloween Treats sticker sheet. The DP is from Pink Paislee. Here's a couple of close up pictures of the stickers and the top of the treat cone. Here's a couple more quick and easy cards. 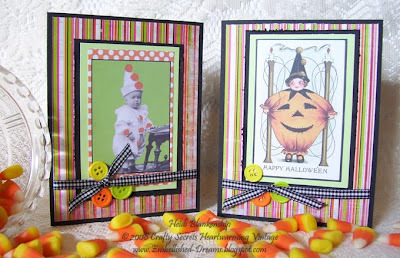 The images for both of these cards came from the Halloween Image & Journal Notes booklets. I absolutely LOVE these little booklets!! Each booklet contains 32 pages packed full of vintage images and journal notes!! Here is a close up of each of the cards. Ok, here is our last project--this one is my personal favorite! Both of these cards have a lot more detail to them--vintage images, stamping, glitter, lace, buttons, brads & a sweet little gem. 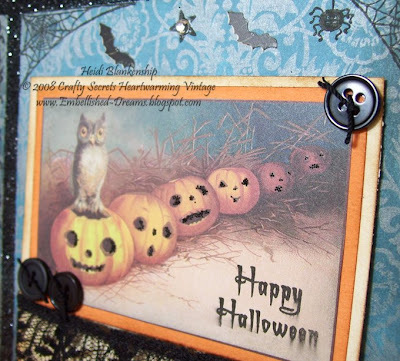 The images are from the Halloween Image and Journal Note booklet, the stamps are from the Halloween Fun stamp set and the stickers are from the Halloween Treats sticker sheet. The DP is from Pink Paislee and all of the other CS is from WorldWin. Here's a couple of close up pictures of the witch card. Here's a couple of close up pictures of the owl card. I hope you have enjoyed all of the projects and all of the pictures! If you are one of the local ladies and you are interested in coming to the class give Tammy a call at Scrapping On The Go! (507) 377-6130 Tammy can give you all the deets--but don't wait too long, I think there is only a couple of spots left! I am really looking forward to the class! You won't want to miss it--Tammy will be having Specials for all of the registered guests, in store and on orders. We will also be giving away Prizes!!! Sandy Redburn, owner of Crafty Secrets is donating two Fantastic Prize drawings which will include Cotton Scraps, Vintage Cuts, Stickers and Image and Journal Notes booklets!!! Hope to see you there!! 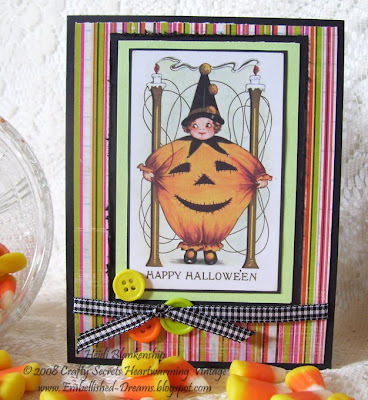 One more *Note* be sure to hop on over to the Crafty Secrets Blog, Sandy is giving away some FABULOUS BLOG CANDY!!! Good Luck!! You can also see two NEW and Wonderful Christmas stamp sets! I LOVE them both!! 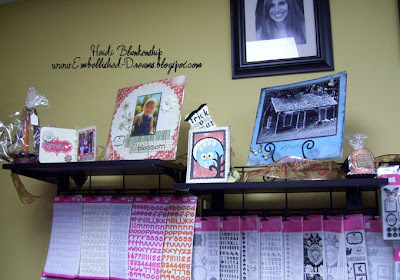 Today is the official kick off for the JustRite Stampers Pre-Inked Stamping Contest!! Click HERE for a complete list of all the Rules. The Pre-Inked Stampers from JustRite are so much fun! 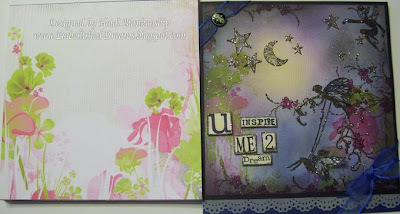 For the cards I am sharing with you today I used the the 2x Stampers, they are so quick and easy to use. The feature that I like the best about the 2x Stampers is that the stamp is up inside of the holder and this allows you to set the stamp holder down on your cardstock (without getting any ink on it!) and line it up for the perfect placement and then gently push down to stamp. Also on the sides of the holder are little markers which can help with lining up the stamp. Here are a couple of cards that I made using the 2x Stampers. 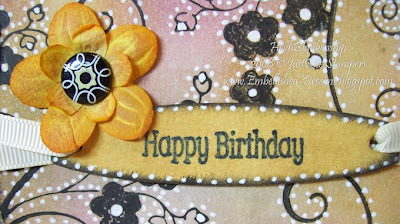 For the first card I used 2x Stampers Happy Birthday sentiment on a piece of chipboard. 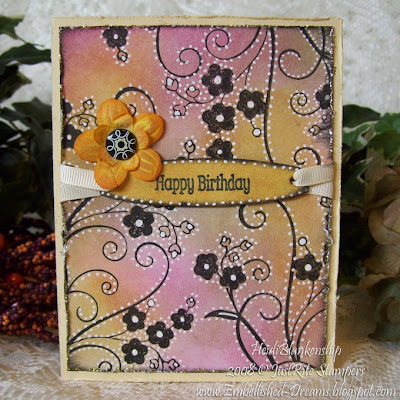 The flower and flourish stamp is from Fancy Pants and the technique for this card is called Bandanna from Technique Junkies. Here is the second card that I made. For this card I used 2x Stampers Thinking of You from JustRite Stampers. 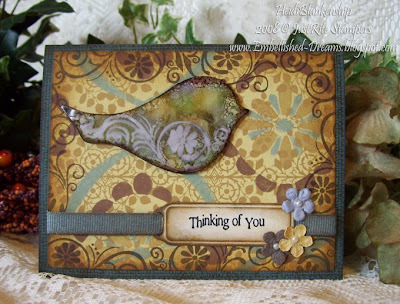 I stamped the Thinking of You sentiment onto a tag that I made using the Wizard and Ribbon Tags Trio Die from Spellbinders. By the way, all of the tags from the Ribbon Tags Trio die from Spellbinders work perfectly with the 2x Stampers! LOVE that!! I also added a few Prima flowers and added little pearls to the center. Here is a quick little tip for you--if you like using pearls but would like to get a larger package and have the pearls all the same size look for pearl alphabet sticker sheets. You can peel the little pearls off and glue them onto your projects and each sheet of stickers will have a few hundred little pearls. The sticker sheet that I purchased has approximately 500 pearls on it and it was $3.99--I think that's a Fantastic deal! 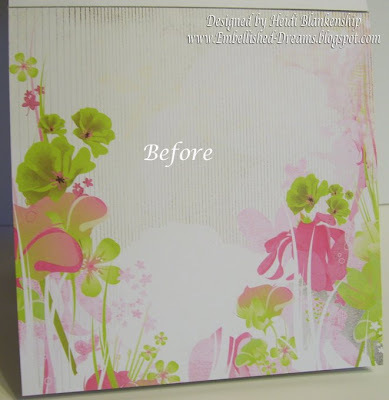 The flourish stamp that I used on the bird and around the edges of the card is from Prickly Pear. The bird die cut is from the NEW Spellbinders Shapeabilities Nested Bird die, there are three dies in this set. The technique on the bird is called Alcohol Inks Faux Bleaching. It has been awhile since I have done this technique but I recently seen a post on Sherry Cheever's (aka Bad Sherry) blog, Walkin' On The Bad Side! and I wanted to try out the technique again! If you like using AI you will love this technique! 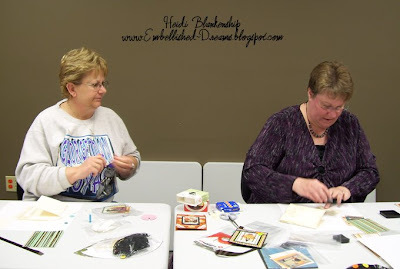 Sherry has a wonderful tutorial on her blog so be sure to check it out! 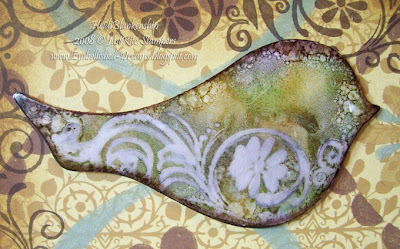 For her tutorial Sherry used an Oval Fragment from Tim Holtz Idea-ology. I don't have any of the fragments (yet!) so I used a piece of acetate for the bird die cut. Thank you so much for stopping by today! I hope you have enjoyed the cards and I can't wait to see what all of you design for the JustRite Pre-Inked Stamping Contest!! Also don't forget to check out the JustRite Blog and the Gallery for some amazing inspiration!! I hope you all have a Wonderful Weekend!! Happy Birthday wishes to my dear friend Miriam!! I have know Miriam since I was little and she is one of the nicest and sweetest ladies I know. One thing that we both absolutely love is anything with a vintage style, all the pretty lacey, frilly and girly-girl stuff. One of Miriam's other friends had asked me if I could make a card for her to give to Miriam for her birthday and I knew exactly what to reach for when making this card! I'm sorry I can't show you just yet what I made for Miriam because she hasn't seen it yet but once she has I'll be sure to share it with all of you. So for today I am going to share with you the card that I made for her friend to give to her. 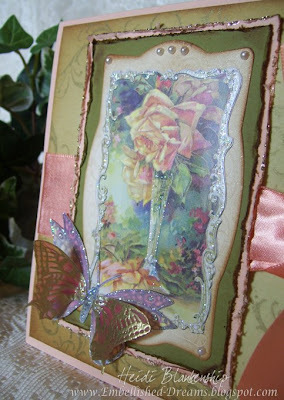 Here is Miriam's Birthday card.~ I think the image of the vase with the roses is Absolutely Gorgeous!! Would you believe that's a sticker!? 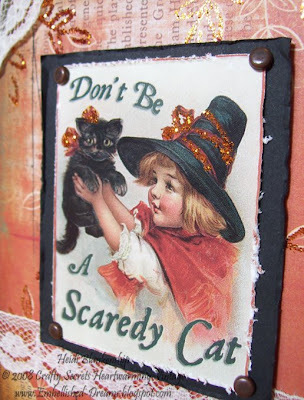 It's from one of the Crafty Secrets Heartwarming Vintage Sticker sheet, Greetings & Sentiments. I added just a touch of Ranger, Diamond Stickles to the frame and the vase on the sticker. Behind the sticker I used a frame from the new Frameabilities die from Spellbinders. For the frame on this card I only wanted the shape so I used the Wizard and the Frameabilites die to cut the shape. 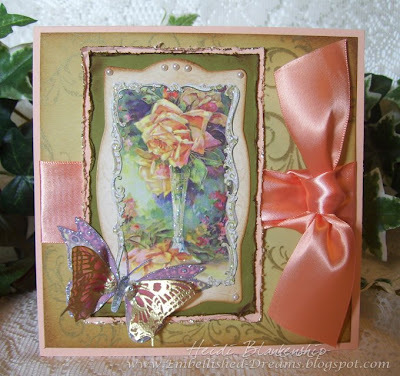 One of the great things about the dies from Spellbinders is that they are so versatile! 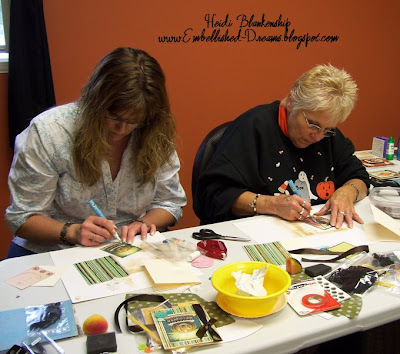 You can cut, emboss & stencil, it's your choice--you get to pick and chose what you want! You've gotta LOVE that!! For the butterfly I used one of the images from the Crafty Secrets Little Dolls Images & Journal Notes. I love these little booklets!! They are packed full of so many wonderful vintage images and they also have journal notes that you can use with your scrapbooking or on the insides of your cards or however you would like to use them with your papercrafting. I cut out the image and then added some Ranger, Diamond Stickles to the edges & body of the butterfly. 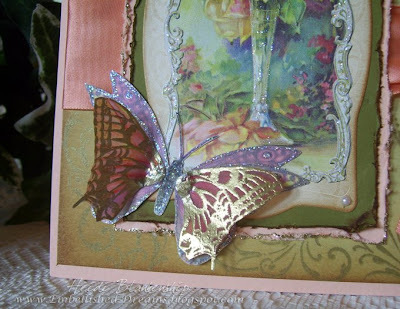 Then I used the Crafty Secrets Altered Art stamp set for the butterfly wings on the top. I stamped the image in gold onto vellum and then embossed it. Then I colored in the backside using Copic markers, cut out the wings and used glue dots to adhere them to the other butterfly and slightly popped the wings up. 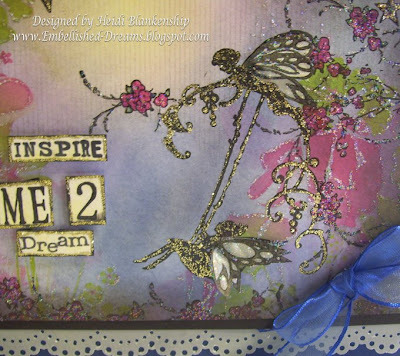 For the background paper I used a flourish image from the Crafty Secrets Cherubs stamp set. I used gold pigment ink and then I used a sponge to gently rub the ink into the paper which gave it a softer look. Then I sponged the edges of the cardstock using Ranger Distress Ink, Vintage Photo. All of the CS is from WorldWin and I also added a pretty peach satin ribbon and some pearls. Here is another view of the card .~ Miriam, I hope you had a wonderful Birthday and I hope to see you soon! Hugs to you!! Thank you so much for stopping by today!! I hope you are having a Wonderful Week!! Woo-Hoo!! Two post in one day--now that's amazing! LOL! So tell me how was your World Card Making Day? 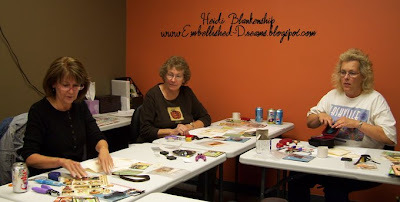 Did you get a chance to do any stamping/paper crafting and have some creative fun? I had a chance to get a couple of cards made today and I had soooo much fun doing it!! It's not too often that I have time to stamp just for the fun of it and make anything my heart desires so I decided that's what I would do today. Here is the first card I made. 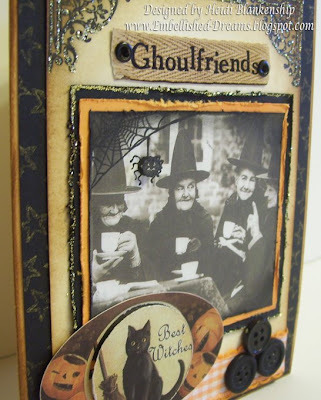 I thought this was a fun card for Halloween. 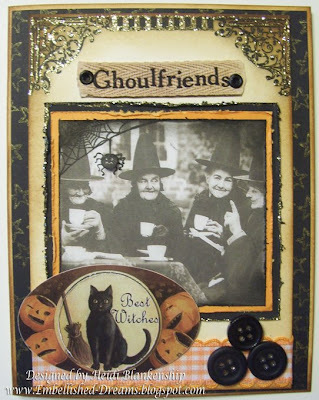 I just LOVE the vintage image of the witches having tea! 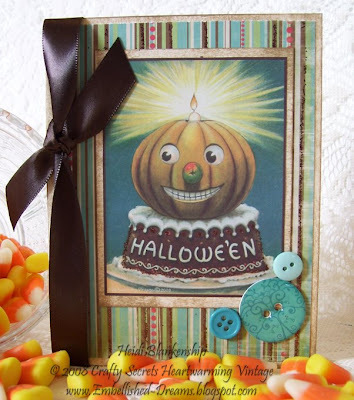 The image is from the Crafty Secrets Halloween Vintage Images and Journal Notes Booklet. 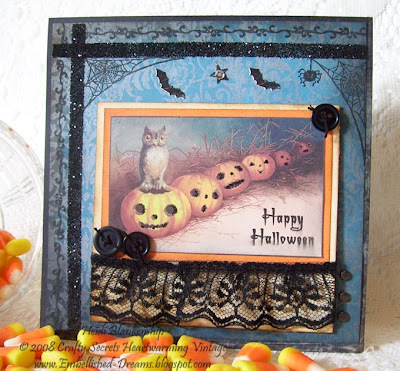 The Ghoulfriends sentiment and the black kitty with the pumpkins are from the Crafty Secrets Vintage Cuts, Halloween Time. 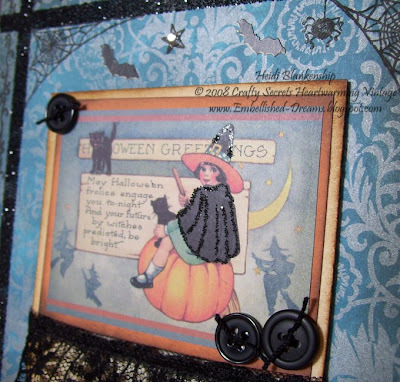 I also used the Halloween Fun stamp set from Crafty Secrets for the corner elements, the stars in the background and the spiderweb with the spider. Then I added a little gold stickles for some sparkle. Here is a side view of the card so you can see the dimension. Isn't that tiny little spider just so cute! Another thing I did that added a little dimension was to take a circle punch and punch out the center of the vintage cuts with the kitty and put popdots behind it. Here is the inside of the card. 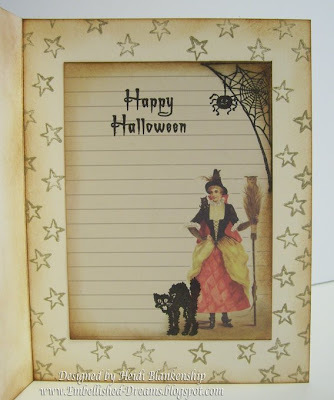 I used the other half of the page from the Halloween Vintage Image and Journal Note Booklets for the inside of the card. Ok on to card number two for the day. I had SO much fun creating this next card!! I know it is completely loaded with glitter but I LOVE IT!! Besides when you think of Fairies don't you think of glitter and fairy dust? I know I do! I took a couple of pictures at different angles so you could see ALL the glitter (stickles). I'm not sure if I had more fun stamping or creating the background on the paper. The paper is from Basic Grey, Sultry 6 x 6 paper pad. I layered several different colors of Adirondack Pigment Ink (9 to be exact!) to get the moonlit night time look. Here is a list of the colors I used and in the order I used them--Lemonade, Shell Pink, Cloudy Blue, Cool Peri, Sail Boat Blue, Purple Twilight, Denim, Eggplant and Pitch Black. Then I stamped all of the images using Pitch Black Adirondack ink. . 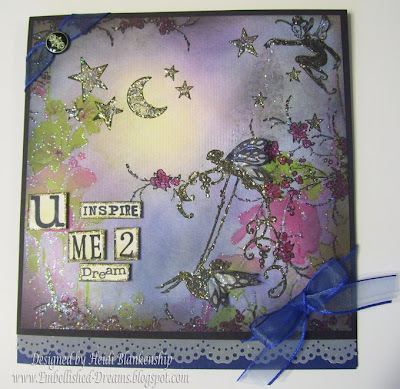 The stamped images are all from Crafty Secrets, Fairies and Cherish stamp sets. For the sentiment I used several fun stamps from JustRite Stampers and Cryogen White CS. The U was done using the Pre-Inked Stampers, Typewriter Lower Case. Inspire is from the Small Pre-Inked Words Set, Emotions. The word me was done using the letters from Times New Roman Font Set and a Wooden Stamper (from the Curlz Starter Set). The number 2 was done using the Medium & Large Number Set. Dream is from the Small Pre-Inked Words Set, Inspirations. Here are a couple of close up pictures. To color in the stamped flower clusters I used two Copic Sketch Markers, Deep Magenta RV17 & Willow G24. The blue ribbon is from my stash and the pretty brad is from BoBunny. 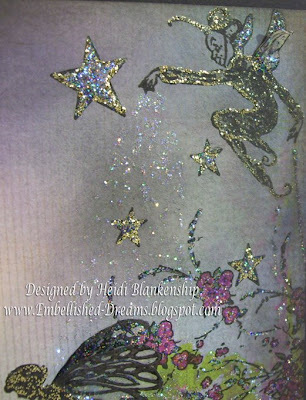 For the fairy wings I used vellum that was lightly sponged with Lemonade Adirondack Ink and then stamped the images using Pitch Black Adirondack Ink. Once the ink was dry I added some Star Dust Stickles and then cut out and glued them in place. I also used a strip of the vellum along with the new Martha border punch to make a beautiful scalloped edge. I also added gold and star dust stickles to all of the stamped images, around the sentiment and to the images that were still visible in the background paper. Here is a picture of the Basic Grey DP before I started inking it all up. I LOVE INK!! Here is a side by side picture of the paper before the inking and the finished card. I hope you enjoy the inspiration for today! Thank you so much for stopping by again and I hope you all have a wonderful weekend!! Also don't forget to check out the JustRite Blog for some really fun BLOG CANDY and all of the details on the PRE-INKED STAMPING CONTEST! !